Healthy forests provide good water. That’s one of the reasons our area is known for the purity of its water. It’s also why BBG scientists are working in area watersheds to evaluate and understand the condition of these forests. Paul Harwood and I have been studying the forests of the Catskill High Peaks for the past few years, compiling a complete plant list and evaluating the forest vegetation. The Catskills are a popular site for outdoor recreation and tourism, but they also provide New York City and other nearby communities with up to a billion gallons of pure water each day. So far, Paul and I have found more than 600 species of plants, including some that are rare or endangered, like the beautiful yellow avens (Geum macrophyllum) and VanBrunt’s polemonium (Polemonium vanbruntiae). The warming climate is of particular concern in the Catskills. On many of the high peaks there are islands of unique vegetation, similar to that found much farther north in the Adirondacks. As the climate warms, the plants on these peaks will come under more stress. The ultimate affect is unknown, so the data we collect will be essential to understanding these changes. 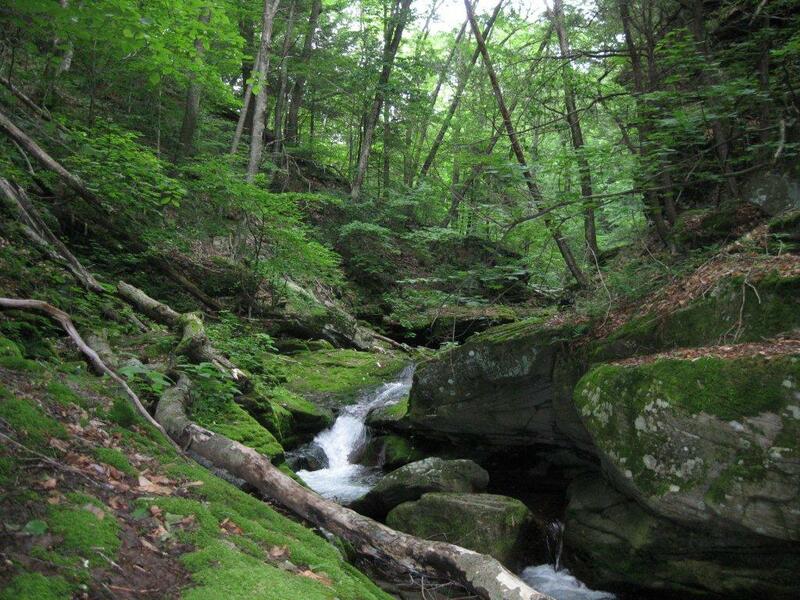 The health of the Catskills’ forests affects millions of people who depend on them for drinking water. Just this year, Paul and I, along with Steven Glenn, also began a new set of surveys in the Wanaque watershed in New Jersey. This system provides more than 200 million gallons of water per day to communities throughout northern New Jersey. On land that was once slated for development, BBG scientists have so far found more than 300 species of plants, including previously unknown populations of rarities like leatherwood (Dirca palustris) and purple fringed orchid (Platanthera psycodes). Water comes to us so easily that we don’t think much about it, but it is a finite resource that must be carefully managed. We ’re helping to evaluate the biodiversity and health of these watersheds so it can continue to be effectively managed in the future. Bear Hole Brook is part of the Catskills Watershed, which provides water for New York City and other nearby muncipalities. Photo by Paul Harwood.